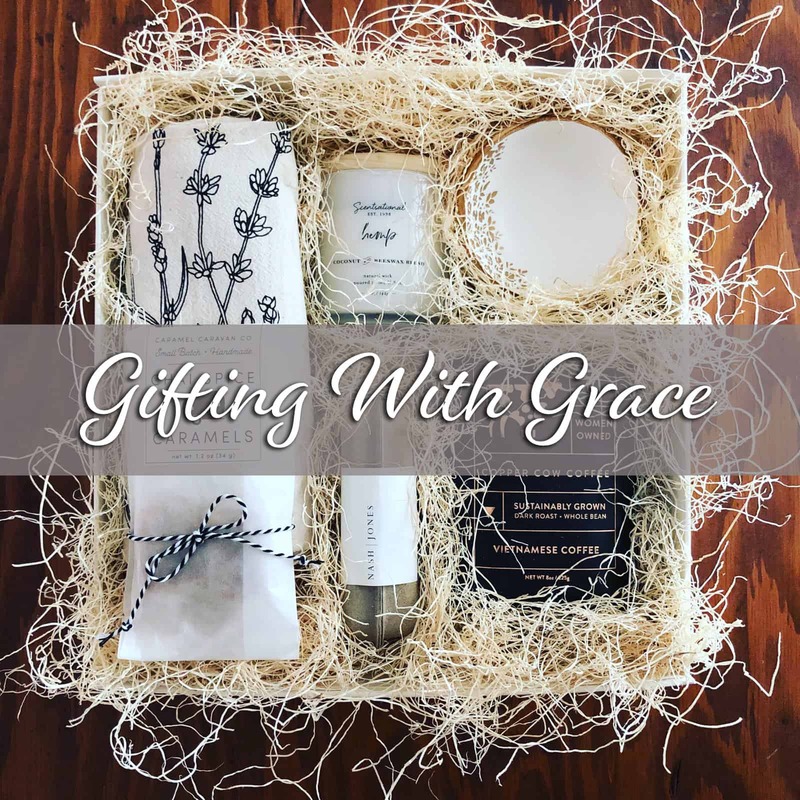 Whether you are searching for client gifts that make a splash, thoughtful welcome baskets for your wedding guests, or a unique way to thoughtfully brighten someone’s day, Kindred + Kel has you covered. By sourcing small batch and hand-crafted goods and arranging them in beautiful packaging, we make the art of gifting simple, convenient, and fun! This week, I was blessed with the great honor of sharing some gifting tips and client care strategies with a group of realtors and developers here in Wichita. In my past career, I addressed large crowds on a regular basis, gave presentations on a daily basis, lead a minimum of twenty coaching calls a week, and running a training class would have been no big deal. This week, as I slipped on a pair of heels for the first time in almost a year, I felt completely overwhelmed and about an inch tall. The messages that I was telling myself were defeating and tore me down. I am so grateful for a husband who took time away from his own business to support me...and to share truths with my anxious heart. Isn’t it crazy to think of the things that we say to ourselves that are total lies? Did the presentation go perfectly? Nope...not even close. Did I find joy in sharing my passion with others...oh, you bet I did! Fear is a liar and we can become our own worst enemy. If your heart is anxious this morning, please hear me when I say that you are enough. Let your soul find rest in the understanding that you are unique, special, and equipped to accomplish beautiful work. When I purchased this sign, it was during a time in my life that each moment seemed heavy and close to impossible to reach the next. I hardly recognized my life and what it had become. My hopes and dreams had been shattered and I found myself starting over. On a particularly dark day, I found myself wandering through an antique store, when this sign caught my eye. It was one of the very first items that I purchased for my new space as a new chapter began. I clung to this beautiful reminder. Live for today. Happy two months to this little Kansas cutie!! I have been just a bit preoccupied these past few months with our new baby girl, but we will still be launching a new line of gift boxes in a few weeks! Baby naps, and Mommy works! I have thoughtfully handpicked the most beautiful and unique products from across the country to ensure that each gift is one that you can be proud to send! I am committed to make sure your recipients feel loved and appreciated...and that you look like a gifting rockstar!! Working on some gifts for a thoughtful mama who is sending care packages to her daughters at college...just in time for finals!! Seriously, how thoughtful is this?!? Kindred &plus; Kel Kindred + Kel updated their profile picture. Kindred &plus; Kel Kindred + Kel updated their cover photo. My dad is an engineer. He LOVES the details, the numbers, and he thrives on the elements that most people don’t notice. What caused me to roll my eyes as a kid (secretly, of course 🙈), is now one of my favorite phrases. Every detail of the gifts I create is important to me. Each detail truly matters. Kindred &plus; Kel Kindred + Kel is with Kelly Walton-Glass. Happy Thursday to my friends, both new and old! 1:: I am obsessed with snuggly throw blankets - we have them everywhere in our house and I don’t think it’s possible to have too many! I know I’m not the only one, right? 2:: Several years ago I taught myself how to make candles and sold them in local shops as a fun hobby! I loved to experiment with different and unique vessels. 3:: My bucket list includes seeing Billy Joel in concert. I love classic rock and have already crossed off The Rolling Stones, AC/DC, Boston, The Eagles, Journey, and Lynyrd Skynyrd! 4:: Every piece of clothing in our closet is color coded. I tell myself that it saves time when I’m trying to find something, but I think it just makes my heart happy to be organized! 5:: My favorite household chore is laundry (no joke), which works out because, you know...newborn baby = 64258429 loads of laundry a day. The studio is brimming with stunning new product that is ready to bring smiles and bless souls all across the country! Send me a message and let’s get to work on spreading a little bit of happiness through a well thought out gift for any occasion! I make the process simple and fun. Or you can check out our website to order directly! How beautiful is this bride to be after opening her custom engagement gift from Kindred + Kel? A huge thank you goes out to her darling mama for sharing the vision for this gift and trusting me to select the perfect items. It makes my heart so very happy to share in so many incredible life events with such precious people. Have a wonderful Saturday friends! Kindred &plus; Kel Kindred + Kel created a poll. Hey there friends! I would be honored to get your input on the gifts that I will be offering for Mother’s Day. 1. Offer one gift box design option that will only be available on the website and is created just for Mother’s Day - once it’s sold out, we will not restock. 2. Create multiple one of a kind boxes that are very limited in quantity and post them here on Facebook with PayPal payment accepted. If you would have told me a few years ago that I would be leaving the career I spent years building to start a gifting business, I don’t think I would have believed you. I can’t say that this hasn’t been a crazy ride, or that I never feel scared or worried, but I am constantly amazed at the way everything we need is always provided. Each of us is put here for a purpose. If you have something on your mind or in your heart, but you are scared to take the leap...just go for it! This is going to be a fun and busy weekend for our family - how are you spending yours? Who’s up for some FREE happy mail to brighten your day next week? If you have been a customer of Kindred + Kel in the past OR you have received a K+K gift, you’re in luck!! 1. Leave a review on our Facebook page sharing what you loved about your experience. 2. Send me a message with your address. 3. Keep an eye out for something fun to arrive! If you have already left a review, THANK YOU! Send me your address, and you will be included in the fun! I don’t know about you, but losing an hour of sleep wasn’t a huge hit in our house this weekend 😂 What a joy it was waking up filled with excitement for the gifts that I will be working on this week - sleep deprived, but SO thankful!! After we learned that our little love was on the way, I took a huge (and scary) leap of faith and left my job as a sales director and franchise owner with a national advertising company to stay at home with our sweet baby girl. I needed a creative outlet that would also allow me to help pay for all of those diapers! With our daughter in one arm and a handful of box filling in the other, I am creating thoughtful and unique gifts at my home based studio and living my dream. I am so thankful for all of the support and business that I continue to receive for my wonderful friends, family, and community! Don’t forget to join in our giveaway for your chance to receive a darling spring gift basket! Check out the details just a few posts back. What a whirlwind the last few weeks have been 🎀 We are absolutely in love with little Edie. Thank you for your support and prayers as we begin this new journey! Preparing to ship out this thoughtful gift from one friend to another. Sometimes gifting can be overwhelming - let us help make it easy and fun! Kindred &plus; Kel Kindred + Kel shared a post. Happy Monday! Don’t know about you, but this cheery gift makes me feel a tiny bit less depressed after our Chiefs loss last night. How ‘bout a little sunshine on this cloudy day? I have been having such fun putting together bright and cheery items for January gifts! This little beauty is on its way across the country to spread some joy and intentional kindness between friends! Packaging this gift was a little extra special because it was a result of someone that I have never met before recommending Kindred + Kel and supporting my small business! I can’t express how much this means to me and how incredible it is to know that through this journey we have already been able to bring so many smiles to faces all across the country. Oh my goodness! I am so honored to have our story shared on my dear friend's new blog...what a blessing! Take a minute to read through the post and subscribe for more amazing content. Wow - December was one busy and wonderful month! I am still trying to wrap my head around the blessings that we experienced through Kindred + Kel. What a great opportunity to learn and develop the business. Thank you for shopping small for the Christmas holiday and supporting my dream. Just in case no one told you today...you rock!!!! Now it’s on to Valentine’s Day! I just received the most beautiful vegan soaps from Soprano Labs that will be making their debut in our Valentine’s boxes. They smell incredible and of course the color is stunning! Send me a message if you are ready to knock out a custom gift for your special someone, or check out the website for curated boxes that are ready to order! Sent this little cutie on its way a few days ago to celebrate a birthday! If I can help you send some happiness to someone special write me a message and let’s spread the smiles all around! With just a few more gifts to ship out in the morning, it’s time for me to settle in and celebrate Christmas with loved ones. Thank you all for your support of my little business and for such an incredible holiday season. My heart is overflowing with gratitude...here’s to many more thoughtfully curated gifts in the new year! Hey there Wichita friends - there is still time to order a custom or curated gift in time for Christmas! I have a few more delivery times open and would love to work with you. We can put something stunning together starting at just $30! Off to the post office to ship a bit of happiness all across the country - such a fun day! 📦 Thank you all for sharing my business with others. I just can’t tell you how much it means to our family! With the cold weather outside and the warm smells of the holidays, we love our “Cozy Mornings”! Give the gift of a “Cozy Morning” to those special people in your life. Did you know that for a $5 flat fee we deliver your gift to Wichita and the surrounding areas? Just select local delivery at checkout and let us make a fabulous impression on your behalf! Have you ever tried a sea sponge? We use only the best sponges - harvested from the coast of the Bahamas and nestled in our curated gifts. Not only are they beautiful, but they offer gentle exfoliation that allows fresh new cells to be exposed! Check them out in our “You are My Sunshine” and “Rest and Relax” boxes, or request them in your custom gifts this Christmas! I just can’t wait until tomorrow to tell you! The website got a mini face lift this week and the new line of gifts for the holidays are officially live - many of them are under $50, so you can look like a gifting rockstar and stay under budget this Christmas! Happy Thursday to my friends new and old! I sure am glad to have you along for the ride. There are some new faces following along, so I wanted to say a quick hello and introduce myself...and share this #throwbackthursday photo from the year I spent three hours making an ugly Christmas sweater for my boyfriend (now husband) to wear to the Army holiday party! My name is Kelly and I am the face behind the box here at Kindred + Kel. What started as a hobby has now grown into a business that will allow me spend more time at home with my sweet girl when she arrives in February and as a way to spread smiles...and of course warm fuzzies! Gifting has always been something that brings me great joy and makes my heart happy. There’s nothing better than putting a smile one someone’s face through a beautiful gift that conveys intention and purpose. Got an early start here in the studio this morning - we are almost ready to launch our gifts under $50 this week and I could not be more excited! My to-do list is getting longer by the day with gifts to package and deliveries to make...thank you for making this dream a reality! My heart is so full. Another item on my to-do list is to resist eating all of the handmade caramels that just arrived from @oneforkfarm. They are incredible y’all...plus they make the best addition to any gift! Who doesn’t love a yummy piece of caramel?! This holiday season warm the cup and the heart of the coffee lover in your life. Yesterday was busy with filling orders and preparing for Christmas Artisan Market this weekend. I loved taking a break from packing boxes to deliver this beauty to a family that just welcomed a sweet baby boy! I am loving all of these fun custom orders that are being shipped out across the country and hand delivered right here in Wichita! Check out this sweet collection that was bundled with love and topped with caramels over the weekend...isn’t it darling? Do you have someone on your Christmas shopping list that is difficult to buy for? Or maybe you want to send some sunshine to brighten a friend’s day, but you aren’t sure where to start or what items they will truly love? I’m here to help make the process easy and fun! I would like to express my overwhelming gratitude to each and every one of you for sharing the giveaway over the weekend...wow, I am just blown away! Starting this business was a complete leap of faith and some days I feel like a fish out of water. Thank you for shopping small and purchasing gifts from my little business, thank you for liking and sharing my posts, thank you for encouraging me and reaching out to send well wishes. You are all so wonderful and appreciated...what a blessing I have in each of YOU! I would like to announce our Small Business Saturday Giveaway Winner - Megan Dietchler! !